I'm sure many of you know that I love gadgets! 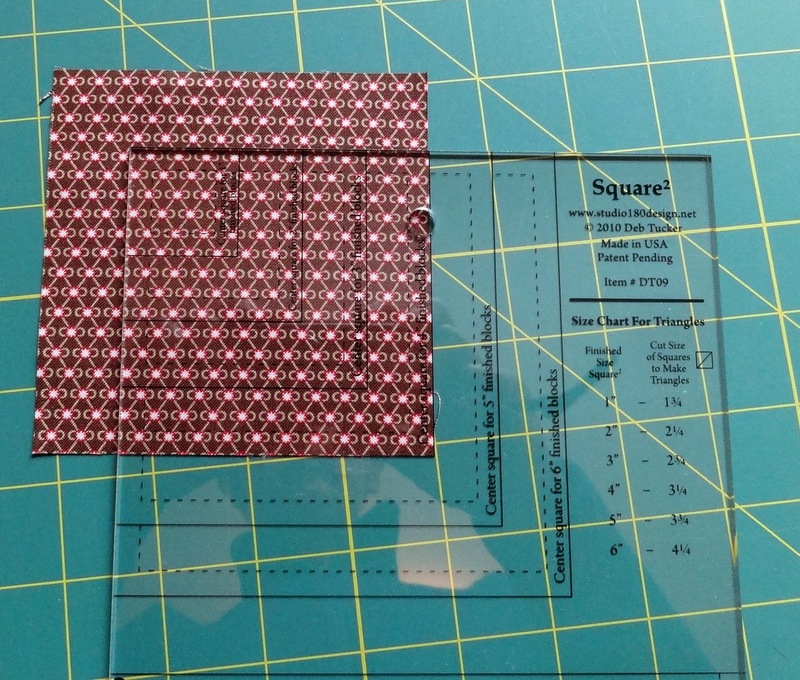 Recently I saw a ruler I had not seen before for making square in a square blocks. 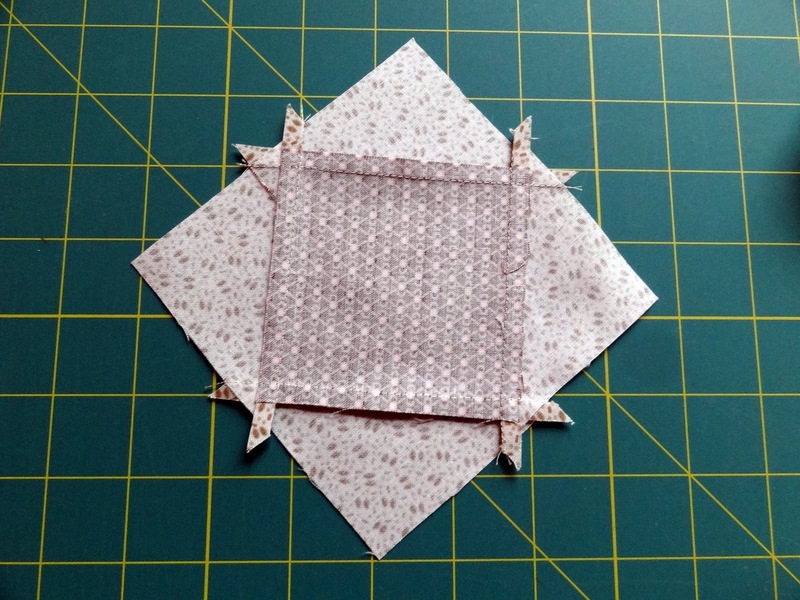 I make a lot of quilts with this block and often have trouble making them come out perfectly square. 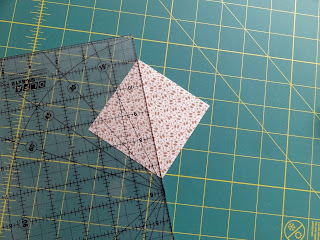 I know that you can cut the corner triangles larger then cut the block down to size, so when I saw this ruler, I had to have it! 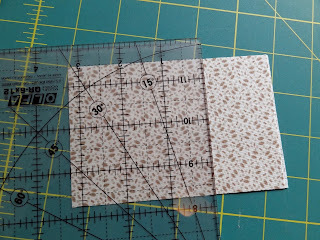 So I thought while trying it out for the first time that I would also post a tutorial for the ruler. The ruler is called Square 2 and it's by Deb Tucker of Studio 180 Design, Ltd. I got mine online from Little Quilts. Here it is on top of some white paper so you can see the markings. 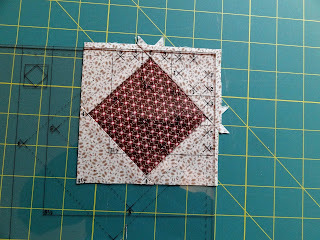 First you determine the size of the finished block - in this case it will be 4 inches. 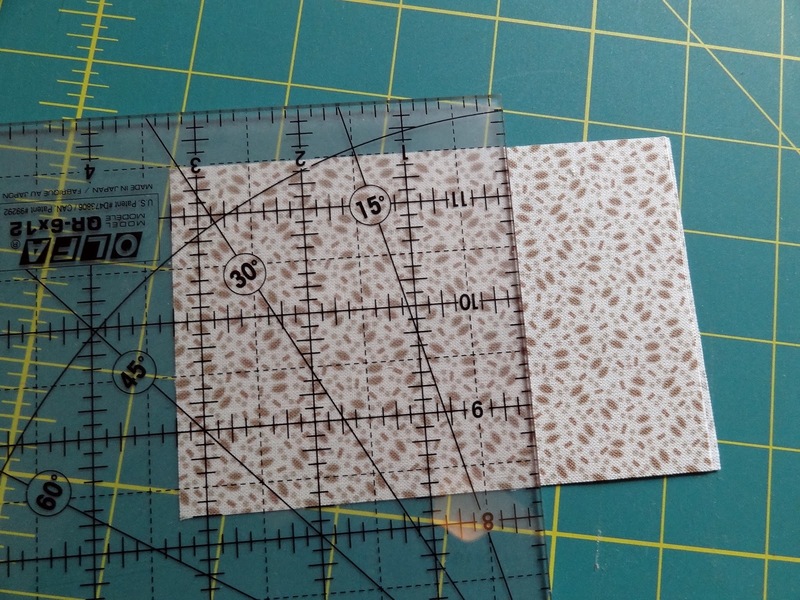 Cut your center square from the markings on this part of the ruler. Here it is with the excess trimmed off. 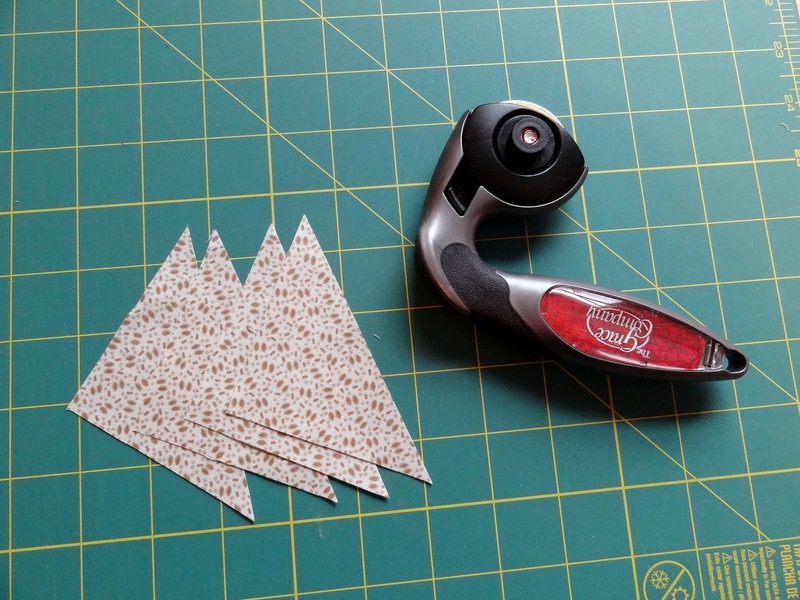 Before you leave this photo, click on it and you will see the measurement you need to cut for the side triangles. In this case it will be 3 1/4 inches. 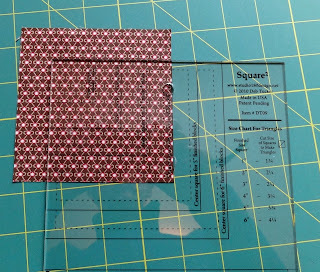 Using your regular ruler, cut two 3 1/4 inch squares. Here I have two layers of fabric. 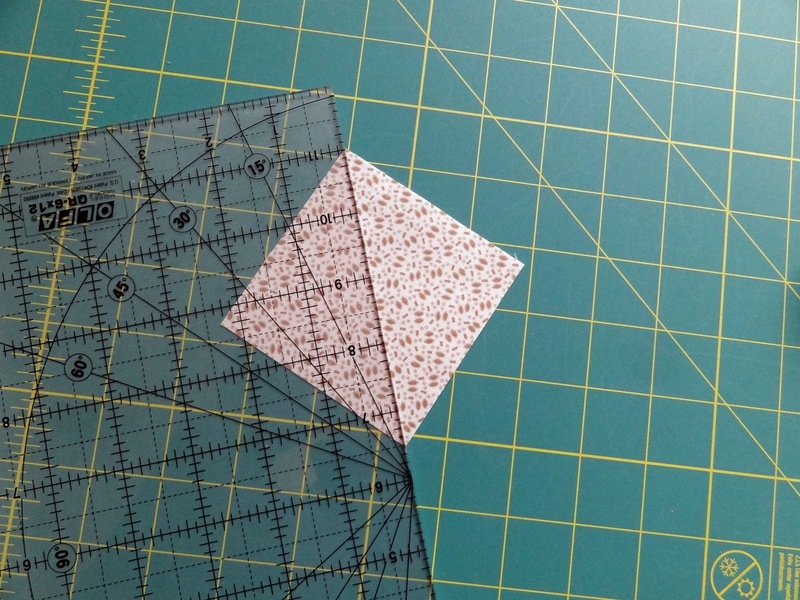 Without disturbing the two layers, place your ruler diagonally from point to point and cut. You now have 4 triangles, one for each side of your square. 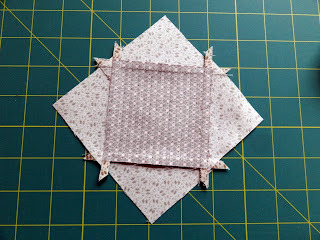 First sew a triangle to each opposite sides of the center square, making sure the triangle is centered with each side of the square. The directions tell you this doesn't have to be exact as you will be trimming off the excess fabric. 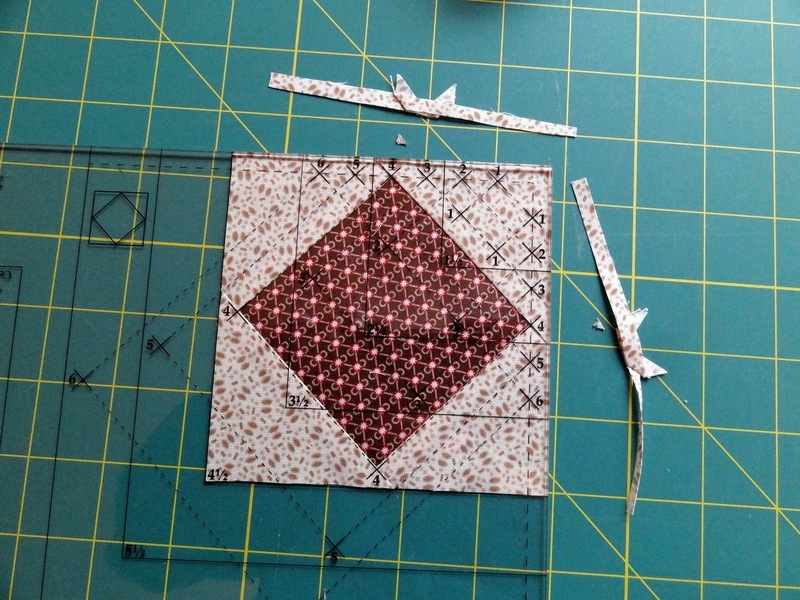 I'm all about the details, so I make a little crease in the center of each piece and match them up before sewing. 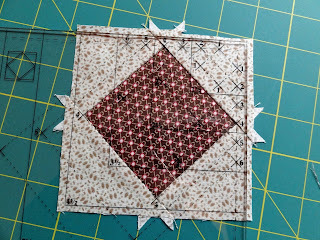 Here I've sewn all four triangles to the square and pressed each triangle away from the center square after sewing each one. This is what your back should look like. 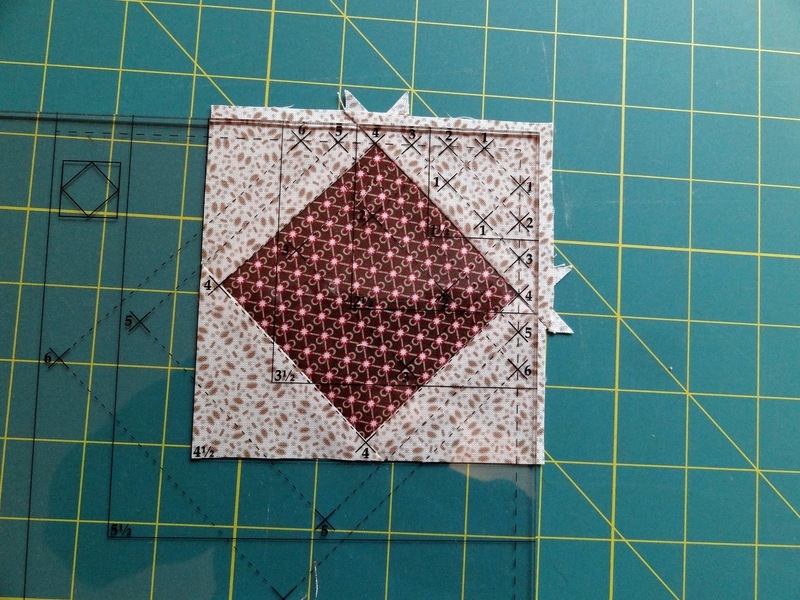 Now take the other end of the ruler and align the 4's (as this will be a 4" finished block) with your center square. Click on the photo for a better look. (The directions are written a bit differently, but this seems to work for me). 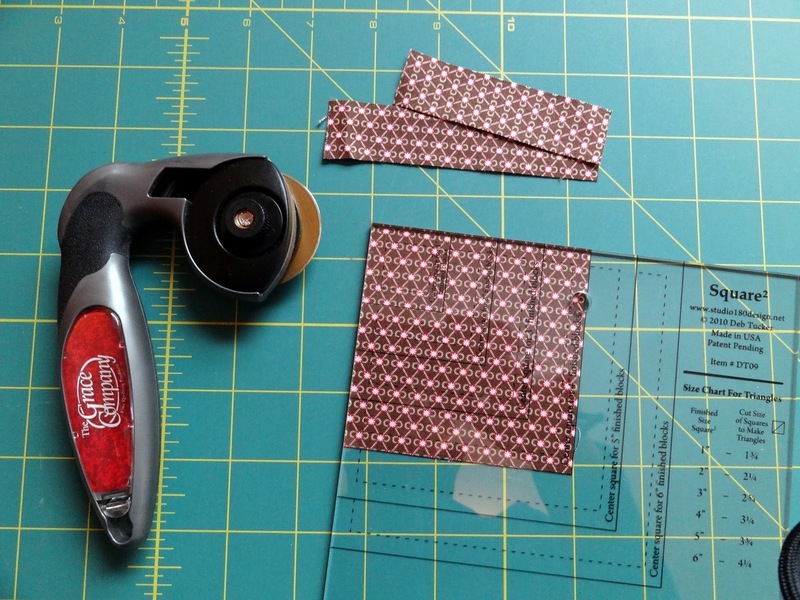 Keeping your ruler firmly in place, trim off the two protruding edges you see here. 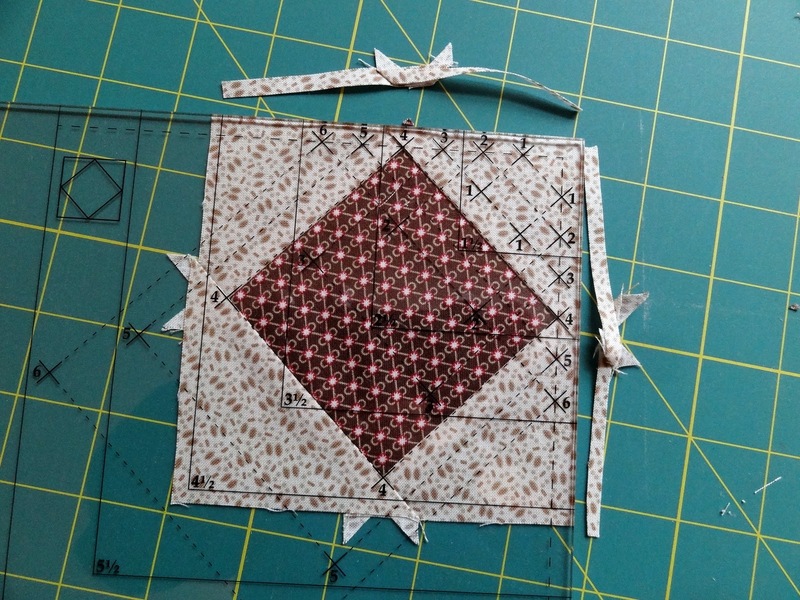 Rotate the block and position the ruler so the remaining two untrimmed edges are exposed. ...Voila! 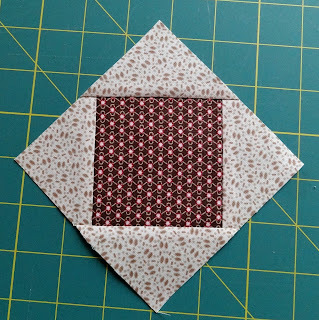 A perfect square in a square! 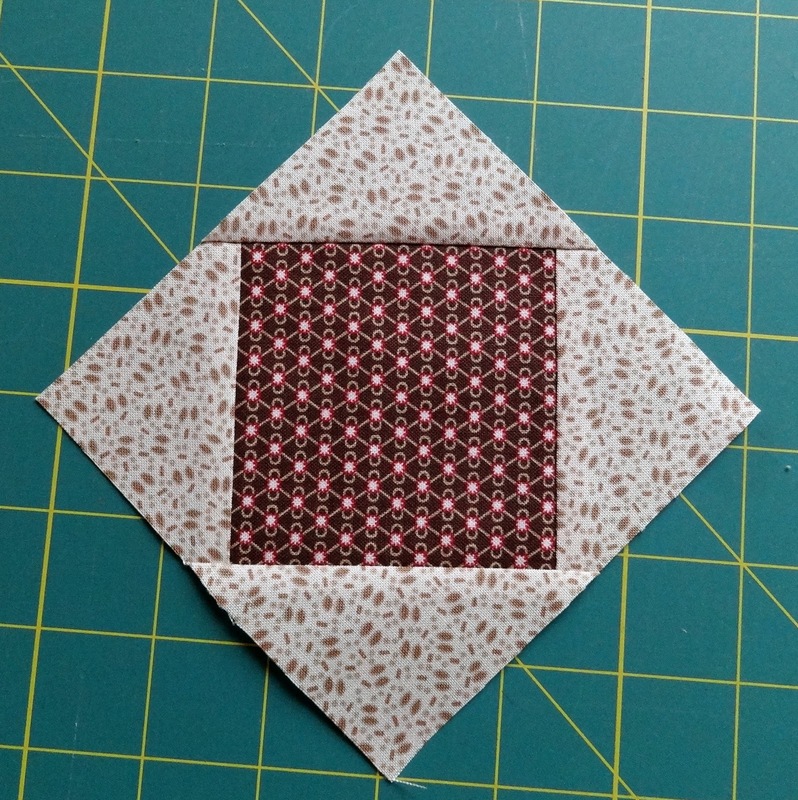 There are lots of different ways of making a square in a square like this, but so far I like the convenience of this ruler - you have it all in one spot rather than referring back and forth to a chart! Great tutorial! This is a ruler that I need to put in my collection of goodies. Thank you so much Candace. 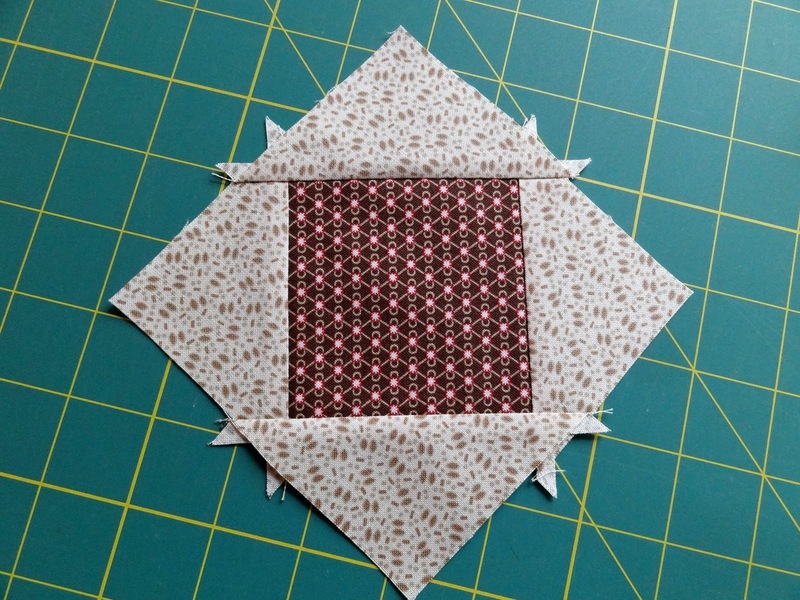 Love the simplicity of square in a square -- looks like this ruler gives you a perfect block. I think I shall start calling you Inspector Gadget. :o) Thanks for sharing. Wonderful tool. 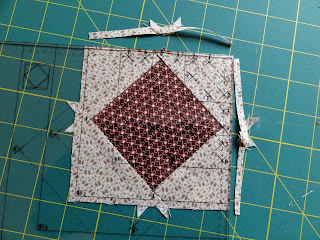 The first time I made square in a square blocks they were such a mess! Not a one of them came out right. 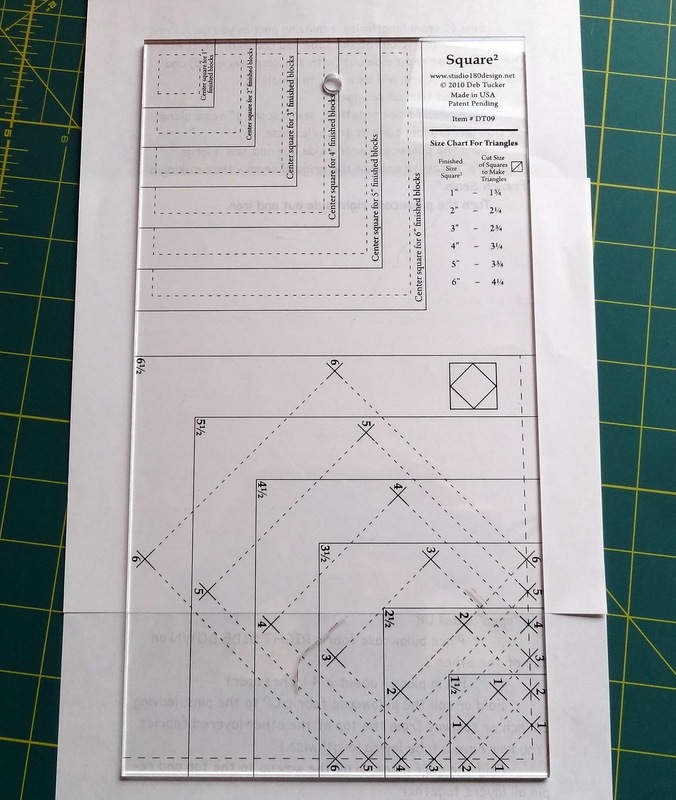 I am in such admiration of the folks who come up with these marvelous rulers. The little engineer in me likes this! What a great tutorial, Candace. 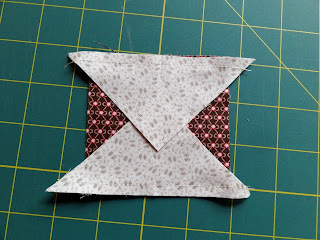 Beautiful block, too! This booth was very popular at the Road to CA show but I didn't linger. Looks like a great way to get nice and crisp blocks every time. Great little tutorial, Candace. I bought that ruler years ago. I will have to look it up. that is pretty cool. I like the idea of it all being there for you too. Very clever! 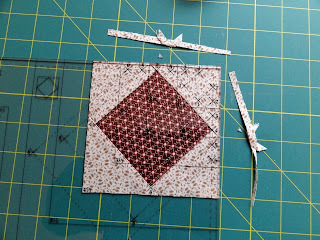 I have other rulers from Deb Tucker; she is one super-smart quilter. 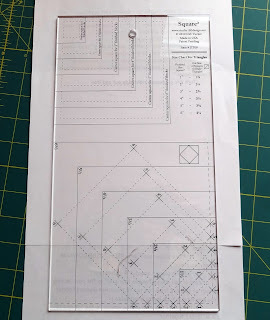 Hi Candace, I just purchased this ruler and shared it on my blog this week, but not as thoroughly as you did! thank you. 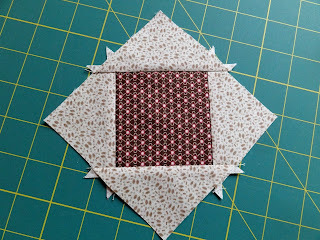 I was able to use it but wish I had seen this first :) It is one of my favorite blocks and now I don't fear it!